Revit software is specifically built for Building Information Modeling (BIM), empowering design and construction professionals to bring ideas from concept to construction with a coordinated and consistent model-based approach. It includes the functionality of all of the Revit disciplines (architecture, MEP, and structure) in one unified interface. NOTE: Revit v2019 is NOT compatible with BIM Team. 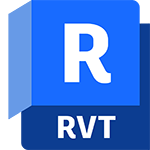 If your workflow currently includes BIM Team and Collaboration for Revit it is recommended you install Revit v2018.